Today on Serious Grape, the wine column I write for the fantastic food site Serious Eats, I've got a wine survival guide to get you over the late summer blues and through the early fall crazies. It includes my shopping list for a mixed case of wine so you will always have the right bottle to try with your takeout, put on your table when entertaining, and pair with all your transitional meals. Rather than running to the store every time you need some wine, this will give you that comfortable feeling that you're ready for any eventuality. A mixed case is kind of the wine equivalent of restocking all your pens, paperclips, and computer supplies. Check it out and see what you think. Most importantly, remember to ask your wine merchant for a mixed case discount. It's a typical courtesy that many of us don't take advantage of, but if there's a time to take every discount coming to you, it's now. It's hot. I'm hot. I'm tired. I'm overworked. I'm eating lots of takeout. There is no joy so profound as I experience back to school, Labor Day, and the looming need to buy fall clothes as a cool bottle of Riesling waiting for me in the fridge when I pull into the driveway after a long day of work with a few cartons of Thai, Chinese, Vietnamese, or Japanese food sitting on the passenger seat next to me. Riesling is the perfect match for Asian food, and because you can store it in the fridge it's always ready when you need it (just let it warm up for 10-15 minutes before your drink it or you'll miss out on Riesling's extraordinary aromas). Because I love its low alcohol zinginess and Asian food-friendliness so much, I'm always on the lookout for new labels I haven't tried before. 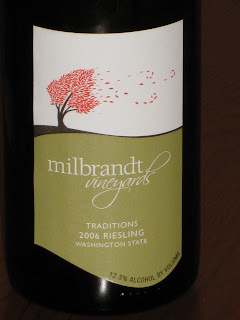 My latest discovery is the 2006 Mildbrandt Traditions Riesling from Washington. I purchased this for $12.49 in my local grocery store; you can find it near you for between $10 and $15. It was pale in color which suggested cool, clear water. The aromas and flavors ran the spectrum of citrus and flowers from orange blossom, to Meyer lemon, to lemon peel. There was a nice, juicy finish that kept you reaching for more to sip along with your ever-diminishing pile of pad thai. This wine also had a relatively low alcohol level for a domestic white at only 12.5%, which is good news when it's so hot outside. What I loved most about this wine was that it was slightly off-dry but still restrained and balanced. Oh, and I loved its pricepoint, too. This certainly qualifies as a wine with excellent QPR, given its clear, refreshing citrus and floral flavors. It may not be as complex as a German Riesling, but it will combine with your takeout beautifully. So if you see this in your local store buy several bottles, leave them in the fridge, and the next time you're running late and General Tso is your dinner date you'll have one less thing to worry about. Today I'm participating in the 4th edition of the Wine Book Club, hosted by Farley the Wine Poet from Wine Outlook. The title she picked, Jancis Robinson's Tasting Pleasure, was one of those classic wine books that I always meant to read, but somehow never quite got around to opening. I'm so glad that Farley got this book of my shelf and into my hands. Robinson has a wonderful voice when she writes, and I was quickly caught up in the story of how she developed from a wine novice to a wine expert. Robinson's wine roots go back to Italy, where she drank wine from the local co-op while working as a maid in a hotel, but her earnest study of wine happened at Oxford University. You may associate Oxford with rowing, rugby, and the debates at the Union (not necessarily in that order) but I can tell you from first-hand experience that the University may be the world's best wine-appreciation experience for those under 21. Colleges and other university institutions have had cellars since the medieval period, and students and dons in residence there take wine knowledge as seriously as they take Shakespeare's sonnets and particle physics. It was not until Robinson left Oxford that she began her circuitous route (via working in the travel industry and working in a wine bar) towards becoming a wine writer. And it is where Robinson talks about writing about wine that she is at her absolute best in what is a marvelous all-around book. Throughout this memoir, the reader is struck again and again by her sensitivity to the individual palate, her concern that truly extraordinary and different wines don't become lost in a sea of homogeneous wines shaped by a mysterious collective palate that emerges in tasting panels, and her humility concerning what she still doesn't know about wine. At points, she almost apologizes for her hesitancy in making wine recommendations, but this (I think) is one of the reasons she is so very good at what she does: she believes that all she is qualified to tell you is whether she likes a wine or not, and why. The subtitle of this book, Confessions of a Wine Lover, is really the best possible description for her chatty, informal, and tell-all story. Robinson does not tell us everything, perhaps, but she tells us an awful lot (including her childhood experiences battling anorexia) in a way that makes us laugh, gasp in admiration, and shake our heads in disbelief at the way the wine world works. By the end of the book, it is almost impossible not to like her enormously and respect her deeply for what she accomplished as one of the first women in the wine writing business. A resounding thank you to Farley for picking this classic title. If you didn't read along with us these past two months, I hope that this review convinces you to put Tasting Pleasure on your list of must-reads in the future. Farley has promised us a round-up of posts next week, and I'll post the title we're reading for the 5th edition of the Wine Book Club on September 2. And if you'd like to participate in the Wine Book Club as a host or as a "Spin the Bottle" featured reviewer, please let me know in the comments or by dropping me an email. Do you like wines from the Beaujolais made from Gamay? If you do, have you tried an Italian variety called Cesanese? When I tasted it all I could think of was that it was Italy's indigenous analogue to that better-known French grape. Cesanese grapes are a particular point of pride for the Pallavicini family, who have been growing grapes in the Lazio region since the late 1600s. They have been working to preserve indigenous varieties such as Malvasia del Lazio, Ciliegiolo, and Bonvino as well as planting international varieties such as Cabernet Sauvignon and Petite Verdot. Their 2005 Pallavicini Tirso was a light bodied-red wine made with 100% Cesanese that is ideal for serving slightly chilled just as you would a Beaujolais. ($7.99, Weimax; available elsewhere for around $14) It was dark eggplant in color with grapey and plummy aromas and a touch of deep earthiness. The flavors continued along in this vein, with the earth coming farther forward to meet up with the plums. The wine had 12% alc/vol and there was a juicy aftertaste. This simple wine was pleasant and refreshing and at well under $10, it represented good QPR so long as you aren't expecting a robust Italian red. Cesanese is an ideal partner for simple, rustic bistro or trattoria food. We had it with a quick version of Pollo alla Romana, where chicken is cooked with peppers, tomatoes, capers, and prosciutto. With some crusty bread and a big salad, you've got a perfect meal. The wine's earthiness and fruit flavors went well with the acidity of the dish and the sweetness of the sauteed peppers. With all the fresh tomatoes in local farmer's markets and ripening on backyard vines, this is a grape to remember when you're looking for something to pair with late summer tomato sauces and salads. So try Cesanese if you get the chance. 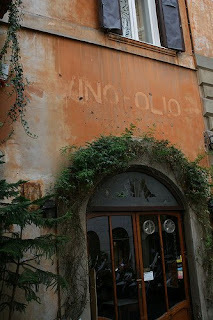 But beweare: the increased demand for Italian wines may have led to a reorganization of Pallavicini labels. The Tirso label is no more as best I can discover, replaced by wine labeled "Cesanese" and a different picture. 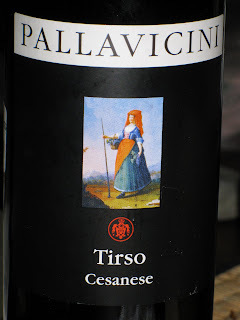 The label for the 2005 Tirso is now being used for a Sangiovese wine called "Tiaso." So if you see this wine in the store, make sure that you're getting Tirso and not Tiaso if you're trying to secure some of this rare Italian grape. Coordinated by Jeff Lefevere of Good Grape, the release of these wines into the hands of bloggers marked what I think will be seen in future years as a turning point in how wines are reviewed in this country. Those of you who haven't been following this story, and even those of you have, might be interested in hearing a little bit more about how this all came about. Earlier this summer, Jeff Lefevere contacted a group of bloggers including Tim Elliott of Winecast, Renee Wilmeth from Feed Me/Drink Me, Sonadora from Wannabe Wino, Joe Roberts the 1 Wine Dude, Kori from Wine Peeps, and master sommelier candidate Arthur Black who guest blogs on Good Grape. He wanted to know if we would be willing to participate in an experiment with Rodney Strong in which we would receive a bottle of soon-to-be-released wine in exchange for an assurance that we would blog about some aspect of Rodney Strong's Rockaway Vineyard project during the week of August 18. We were free to blog about anything. We were of course free to report if we didn't like the wine. The only requirement was that we blogged something during that week. If you follow the links to the participating bloggers above, you will discover that our notes are consistently positive and quite similar in terms of what we tasted, but I hasten to add that we all tasted the wines independently and wrote our reviews independently. Why did Jeff want us all to blog about this topic in the same week? It was not because it was "payment" for the review. Instead, Jeff wanted to be able to gauge the impact of a group of bloggers working simultaneously on the same wine. One of the questions that bloggers wonder about is do our individual voices make a difference, and would we be more powerful if we were working in a group? I think it will be a while before we know what the impact of this experiment might be. I do think that this will not be the last time that winemakers will release their wines to bloggers and print journalists simultaneously--even though this was, to my knowledge, the first time such an effort has been made with a higher-end wine. After participating in the Rockaway experiment, I remain convinced that the #1 advantage that bloggers have over print media is simply this: time is on our side. It will be months before this wine is reviewed in print. But now, just prior to the wine's release, there are half a dozen reviews of this wine on the internet for anyone who is considering joining the Rockaway mailing list. What do you think about wine bloggers as individual voices, as opposed to wine bloggers joining together in such a project? If you followed the Rockaway project through the blogosphere, did having multiple perspectives on the same wine help you to determine whether you might be interested in it? And most importantly, is this something you would like to see more of with a wider range of wines--not just the higher end bottles? I'd be interested in hearing your thoughts and reactions, and I'm sure the other participants would, too. Stumped Making Wine Tasting Notes? This should sort you out. 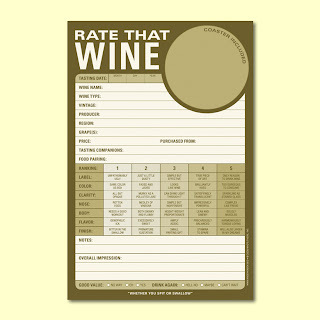 With options like "stamina to spare" in the "Finish" category and "height-weight proportionate" in the "Body" category, this is one tasting note sheet that's suitable for wine snobs and those that love them. Besides it has a "Label" category (yes, you can select "unfathomably ugly") and a coaster is included. Click on image to enlarge. From your friends at Knock Knock, for just $6.99. Buy them by the case now, because come December they will be completely sold out. While you're there, check out the other fine products for back to work/school, like the Paper Voodoo pad, the Daily Mood Tracker mousepad, and the favorite in my office, the Dial-an-Excuse wheel. Thanks, Dad, for the heads up! Finding a Wine You Love? Priceless. 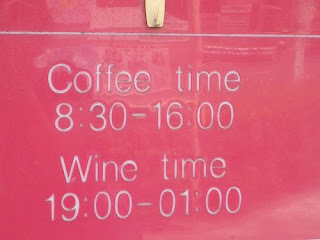 If you are a regular reader of this blog, you know that I don't think it's necessary to pay high prices for good wine. There's plenty of good, food-friendly wine out there to quench your thirst, engage your intellect, and pair beautifully with dinner. That doesn't mean that you should never spend more than $20 on a bottle of wine. One of the reasons to be budget-conscious most days is precisely so that you can afford to splurge every now and then on a wine that you absolutely love, even if it carries a relatively hefty price tag. Finding a bottle of wine that you love, that astounds you, that leaves you tingling and wanting more is something you should do at least once in your life. For me, and for many other Americans, that wine often turns out to be Cabernet Sauvignon. I have never regretted a single penny I've spent on a pricier Cabernet--which cannot be said for the runner up in my list of expensive reds, Pinot Noir. With the latter I often discover I've paid more than I think a wine is actually worth when get around to drinking it. What makes me plunk down more than $30 for a Cabernet Sauvignon? First, it has to taste great and be balanced between fruit and acidity. It also has to have a complexity of sensations and textures that I simply don't find in less expensive, everyday wines. In my experience, what gives a Cab that kind of complexity is an attentiveness in the vineyard to growing and selecting the fruit, and an equal measure of attentiveness and experience when it comes to managing the winemaking process. Neither good fruit nor good experience comes cheap--and I find that I'm happy to pay for both as long as I can taste the difference in the glass. If you are interested in trying and buying some more expensive Cabernet, I've got two domestic offerings that you should consider. Both are from the 2005 vintage, and both are available for $75. Though both will benefit from a rest in your wine cellar, they are perfectly drinkable now if they spend a little time with the cork pulled or in a decanter. I didn't pay for either bottle of wine--but I'll tell you right now that I would pay for them without a second thought if I was looking for an excellent, memorable Cabernet Sauvignon. The first wine that I'm recommending is the 2005 Rodney Strong Rockaway Cabernet Sauvignon. Made from fruit grown in a single vineyard in Sonoma's Alexander Valley, this bottle represents Rodney Strong's entry into high-end wines. The current owner, Tom Klein, wanted to dedicate some of his efforts to making small production wines that were selected from particular places, like the Rockaway Vineyard. The importance of place in this bottle of wine finds expression in the latitude and longitude coordinates for the vineyard that are on the back of the bottle. Like Rodney Strong before him, Klein believes that Sonoma County has the potential to produce world-class wines. This wine certainly proves that the confidence in Sonoma expressed by Strong and Klein was not an error in judgment. If this is what Sonoma County can do in terms of Cabernet, then we are in for some wonderful wine. The wine opened to a dark, dark color somewhere between garnet and aubergine. Initial aromas of plums, currant, and pepper were touched with green herbs and whiffs of smoke. As it opened up, the spiciness increased, and lots of cassis came forward along with some licorice aromas. The whole experience was like drinking in the aromas of a dark bar with jazz playing in the back room. Flavors of blackberry and pure cassis provided the perfect foreground notes for that persistent, dark smokiness of a backbeat that never left the wine even through the peppery aftertaste. Even though it was fruity, this wine was not flabby and had a good core of acidity to give the wine its structure. The wine was surprisingly approachable for a young Cabernet, and had that glycerin texture that I simply adore and which gives wine such a beautiful feeling in your mouth. It took about three days for the wine to knit completely together into a perfect balance of soft tannins, fruit, spice, and licorice aromas and flavors. I think it will age well and continue to develop over the next five to ten years. If you want to get in on this wine before the frenzy begins, you can sign up for the mailing list here. The initial offering will take place on September 1, 2008. After that, good luck because I think this wine will develop quite a following, and deservedly so. Another wine that deserves a following is the 2005 Phifer Pavitt "Date Night" Cabernet Sauvignon. The husband and wife team of Suzanne Phifer Pavitt and Shane Pavitt decided to take no half measures when they got into the wine business. They hired Ted Osborne to be their winemaker, and selected the very best organic Napa Valley fruit from Arthur Spencer's Temple Family Vineyards. Together they wanted to make a wine that was worthy of being shared on a special night with someone you love--even if that special night involves sitting at home and eating In 'n Out burgers. The important thing for Phifer Pavitt is that you enjoy their wine as it's meant to be enjoyed: with family, friends, and food. They even have a place on their site where you can tell them how you enjoyed their wine--and yes, they do read the submissions. I assure you that you will not need the lasso that the lady on the label carries to get someone to share this wine with you, if you are lucky enough to have a bottle. The wine's first impressions are wrapped up in its enticing aromas. It has beautiful, floral aromatics of plum and cherry blossom along with some darker notes of ripe plum and leather. The next impression is all about texture: it's got the texture of silk velvet. If you've never felt silk velvet it's magical stuff. My great grandmother's turn of the century opera coat was made from it, and it has a kind of plush, warm glide that's like nothing else on this earth. When I sipped this wine in Suzanne Phifer Pavitt's kitchen, I immediately thought of that opera coat. Once you get past the floral aromas and the feeling of the wine in your mouth, you will notice blackberry, red currant, and cassis flavors along with a strong core of tobacco, earth, and black tea notes running through it that give it great depth and complexity. The aftertaste is rich and juicy, with a bright acidity that keeps the wine from ever feeling heavy. Proof positive of this fact is that Suzanne served the wine with some farm-fresh tomatoes and a veggie quiche. If you had told me that either of these dishes would go well with a Napa Cab I would have bet you good money that you were wrong. 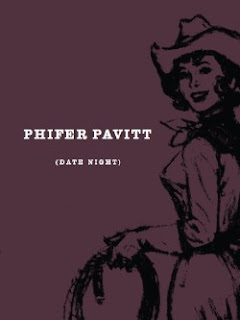 The 2005 Phifer Pavitt Date Night has many good years ahead of it, and I imagine that it will continue to evolve and grow over the next five years. If you open yours up this year or the next, I'd recommend opening it a few hours before serving and giving it a good swirl in the glass, or just decant it to bring out its full potential. As with the previous wine, if you want some Date Night you need to get on the mailing list and see if you can snag some from their initial offering, or pray to the gods you get there in time for the 2006 release later this fall. $75 is a lot to spend on wine every day--but in the market, it's not that expensive for Cabernet Sauvignon of this quality. I'm not sure I agree with Mr. Laube that if you find a Napa Cabernet of distinction for under $75 you should consider it a bargain, but I do think that if you find one that you enjoy for around this price it is worth celebrating, given that the median price for deluxe California cabs is around $115. If you find two bottles you love, as I did this summer, then you are doubly fortunate because when you need a splurge, have a special occasion, or want to make a special occasion out of some takeout and a set of old birthday candles, you will know just which bottle of wine to open. That knowledge may not constitute a bargain, but it is priceless. Feel free to share the wines that you absolutely love and are willing to purchase--despite their cost--below. And don't be afraid to sign up for the mailing lists for these two great wines while you still can. They're worth it--and I don't tell you that about $75 wine often. Sharpen those #2 pencils and make sure you have extra disc space. 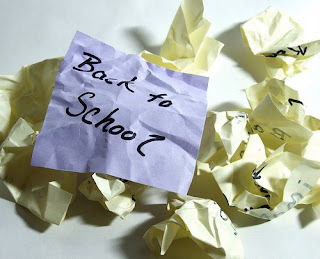 It's back to school time. By this time next week I will have already met 150 of my students for this term, and will be getting ready to meet the final dozen. All of these students will expect me to have my power point presentations in order and to be in the right classroom at the right time. 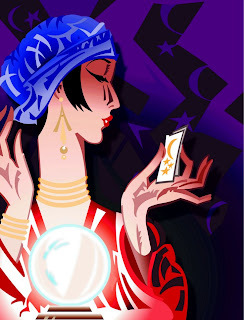 As a result, things might be a bit irregular around here for the next week while I work blogging into my new schedule. 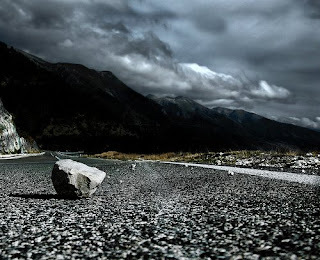 Tomorrow's post will be up and running at the usual time, but bear with me if there are some interruptions after that. Thanks for your patience, and if you or your loved ones are headed back to school, good luck with fall re-entry. There will be some talk of high-end wines later this week on GWU$20, so to balance out the account books I have not one but two picks for good QPR white wines today that are widely available for under $10 and will get you through the dog days of August. One is a creamy Chardonnay, the other a light white Bordeaux blend. I received both as samples and they stood out from many of the other bottles I received because they tasted true to their varietal characteristics and were well priced. First up is the new 2006 Lot 205 Chardonnay. Made by Cartlidge & Brown with fruit from California, the only evidence you will see of their affiliation with the new label is the address of American Canyon on the back. The Lot 205 line of whites and reds will compete handily with Australia in the under $10 category. You should be able to find this near you pretty easily. I was pleasantly surprised by this wine, because it was a nicely balanced, creamy Chardonnay without aggressive oak flavors. It was pale straw in color, and had aromas of butter, cream, and apples. These aromas carried through into the flavors and there was a citrusy, creamy aftertaste that was pleasant and not at all artificial. This wine would be great with grilled chicken with lemon, fried chicken, or grilled halibut. But don't underestimate the appeals of a white wine like this served with some simply munchies and an ice bucket on a Sunday afternoon. Second up is the 2006 Mouton Cadet Blanc from Baron Philippe de Rothschild. This wine is also available widely for under $10. Made from a mixture of 50% Semillon, 40% Sauvignon Blanc, and 10% Muscadelle, the wine was pale straw in color like the Chardonnay. The aromas were very different, however: hay, grass, and the white pith of the lemon that rests under the peel. The flavors were dry and slightly tart, dominated by citrus, lemon pith, and hay notes. 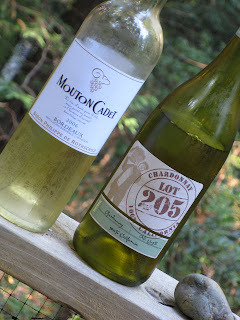 Overall, the wine had a nice roundness from the Semillon and Muscadelle, and nice freshness from the Sauvignon Blanc. This wine is much better with food than it is without, and would be especially good with shellfish or more delicate fish preparations that emphasized butter and lemon. Not too shabby, and would be great with simple fish preparation. It was good with some goat cheese and crackers, and went nicely with a handful of cashews, too. With these chilling in the fridge you can settle down to some serious relaxing before everybody comes back from vacation and the kids go back to school. You'll also be able to afford the extra latte you are going to need to get through it all. We've been in a Pinot Noir state of mind ever since the movie Sideways, but I have my money on another red to become the next break-out grape. Click on over there to see which grape I've picked, and leave me a comment and let me know if you think I'm on the right track. Predicting the next big white grape proved more difficult. I've got two possible contenders there, but I'm not sure if either of them will be able to give Chardonnay--still the white wine leader, despite the best efforts of Pinot Grigio and Riesling--a run for its money. Do you have a more likely alternative? The theme for today's 4th anniversary/ 48th Wine Blogging Wednesday is "Roots." Our founder and host, Lenn Thompson of Lenndevours, asked us to dig down into our wine memories and taste a wine that helped to make us the wine drinker we are today. The reason why I chose this wine is not because it's what I drank in college, nor was it my first fine wine. The reason why I chose this wine is because I first came to understand that wine had roots--that it came from grapes that were grown somewhere and then made into wine by somebody--at Polly Solari's sprawling ranch house on Larkmead Lane in the summer of 1987 when I was a mere 22. It was here, with Polly and Larry Solari, that Larkmead Vineyards began. I was visiting the house with a close friend that I met in Oxford who, it turned out, had a grandmother who lived in the wine country. Mrs. Solari was warm, hospitable, and pulled together fabulous meals out of some amazing produce grown right there. To this day I can remember the taste of the warm white peaches that we ate with vanilla ice cream in her backyard overlooking the grape vines. My friend Geoff and I walked out into the vineyards--my first touch of the vine!--and there were discussions of wind towers, pruning, grape varieties, and more. It would take me another ten years to return to Napa and take up wine with a passion, but I think that the roots of that passion go back to those warm summer days and the extended Solari family's generosity and friendliness. Today, the Solari wine making tradition (which began with Mrs. Solari's husband who came to the US from Tuscany in 1920) is in the hands of Kate Solari Baker and her husband Cam Baker, wine maker Andy Smith, and winery manager Colin MacPhail. Larry Solari was president of United Vintners (think: Inglenook and Beaulieu), chairman of the Wine Institute, and bought the Larkmead properties in 1948. Larry Solari believed in the potential that the property had to produce exceptional wine, and the bottle I tasted certainly lived up to that promise. 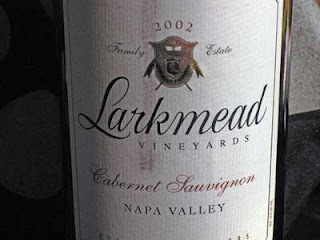 The 2002 Larkmead Cabernet Sauvignon is a stunning example of a Napa red wine. It was rich, dark purple in color and had pure aromas of blackberry, plum, cassis, and some herbal notes. The flavors came forward in lovely layers of black currant, blackberry, graphite, and eucalyptus. The aftertaste lingered, with smoke and herbs catching in the back of your throat. At a time when critics are pronouncing any Napa Cab a bargain if it is $75, this one delivers excellent QPR for its complexity and its elegance, as well as its price point. This is not a monstrous Cab that you will have a hard time matching with food, but to really make the wine shine I'd serve it with some grilled London broil, some Fingerling potatoes sliced in half the long way, tossed with olive oil, rosemary, and salt, and roasted in the oven for about 35 minutes at 400 degrees. Toss a salad, slice some farmstand tomatoes, and cut yourself some crusty bread and you have a meal that Mrs. Solari would have approved which will also complement the wine beautifully. If you ever get the chance to try some Larkmead wine, I urge you to do so. Not only do they make red wines, they also make Tocai Friulano from some of the oldest plantings in Napa (1893! ), and have a second label called Meadowlark. The Cabernet is currently by allocation only, through the Firebelle List (named after Lillie Hitchcock Coit, who was an early owner of the Larkmead properties and also known as "Firebelle Lil"). Thanks to Lenn for a great theme, and this is one of those WBWs where I'm really looking forward to reading the other posts. There is a long history that helps to explain why Spanish varieties are relatively new players on the US wine scene. Most of it has to do with the government--as usual. 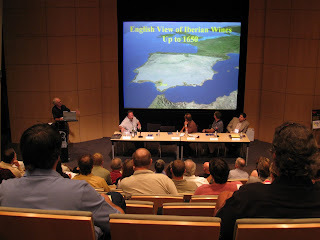 When the Spanish came to the New World way back when, they wanted to protect the Spanish tax base and wine exports and so they prohibited the really good grapes from traveling overseas. What did this lead to? Colonists in pursuit of good wine grapes went to the French, Italians, and Germans which gave grapes like Chardonnay a leg up and put Spanish grapes way behind. Penelope Gadd-Coster of Coral Mustang Wines asked the million dollar question: "Where would Tempranillo be [now in the US] if Jefferson had not been a Francophile?" The tasting that occurred in the afternoon was a real eye-opener for me and for most of the people there because how many times have you ever had a chance to taste 40-45 US Tempranillos side by side? Tempranillo is often likened to Cabernet Sauvignon for its versatility and quality, and that was true in the wines I tasted. I was struck by the wide range of flavors that the grape was capable of producing here in the US. There was everything from luscious, fruit-forward wines to bottles that would have been hard to identify as New World. Coral Mustang's 2004 Tempranillo from the Vista Creek Vineyards in Paso Robles ($22) had smoke, leather and a beautiful balance between these notes and the blackberry and black raspberry fruit. Tempranillo grapes have a smoky flavor, and this wine was made in neutral oak barrels, so any smoke was from the fruit, not the wood. The 2006 Bokisch Tempranillo (not yet released, around $22), had the same beef tea flavor that I last tasted in a 1991 Bodegas Montecillo Gran Reserva Especial from the Rioja, along with roasted herbs, earth, and a smoky aftertaste. The 2005 Six Sigma Tempranillo ($42), on the other hand, used French oak barrels when making its wine which resulted in vanilla aromas and juicy fruit flavors of blackberry and fig along with some coffee. I particularly liked Valley View Winery's 2005 "Anna Maria" Tempranillo from the Applegate Vineyard in Oregon ($24). It was very traditional in its flavors of cherry, strawberry, and cedar, and its lightness and elegance was striking. And Tempranillo is made for aging, as was clear in the 2005 Scribner Bend Black Hat Tempranillo ($14.95) with is cherry, strawberry, and smoke flavors and a core of bright acidity that will soften with time. Tempranillo is also being used in blends, which is true in Spain as well. One blockbuster blend was the 2006 Twisted Oak The Spaniard, which has not yet been released but should please everybody with its ooh-la-la flavors and aromas of chocolate, cherries, smoke, and leather. The 2005 Core C3 Crazy Eights ($39) was made from a blend of 85% Tempranillo and 15% Cabernet Sauvignon. It had amazingly rich blackberry fruit flavors that exploded in your mouth, along with rich cedar and chocolate notes. But the day wasn't all about Tempranillo. TAPAS celebrates all Iberian grape varieties, so there were people pouring wines made from other grapes like Touriga Nacional and Graciano, too. I tasted a 2007 Twisted Oak Graciano barrel sample that was one of the most interesting wines of the day, with its cranberry aromas, smoky aftertaste, and cherry and blackberry flavors. The NV St. Amant Tawny Port ($35) is made from 100% Bastarda and had heady aromas of raisins, toffee, and toasted nuts in a wine with a rich tawny color and a silky texture. Both Barreto and St. Amant produced excellent Tourigas, too. The 2005 Barreto Cellars Touriga (around $25, not yet released) was very drinkable with floral and spice aromas, spicy fruit red and black fruit flavors, and a soft finish. The 2006 St. Amant Touriga ($18) had aromas of violets and spice with cherry flavors, and a hint of beeswax in the aftertaste. As for white wines, I think they are still a work in process. There is enormous potential in the Albarino grape, as well as in Verdelho. Albarino has the body to bump Chardonnay of its perch, and Verdelho should be on every table that is currently adorned with a simple Sauvignon Blanc, but right now the wines are a bit unfocused and I think the emphasis is on making quaffable wines. Nothing wrong with that of course, but I think we will see more wine makers trying to craft something more distinctive with these varieties. The 2007 Bokisch Mokelumne River Albarino ($16) takes a big step in that direction, with sensational aromas and flavors of orange blossom and buttered apples, balanced acidity, and a crisp yet juicy finish. This was an extraordinary and memorable white wine, and shows just how great Albarino can be. Based on this event, I think we can all look forward to some golden years of drinking wine made with Iberian grape varieties right here in the US. It will be exciting to see what the grapes do as more vines are planted, and what wine makers do with the juice once more of it is available. If you haven't yet discovered these wines, you are in for a treat. If you have, let us know what your favorites are in the comments. Our neighbors to the north make some great wine--and not just ice wine, either. Until now, I have to admit that the only Canadian wines that I've had were the lovely dessert wines that are made after grapes freeze on the vines. 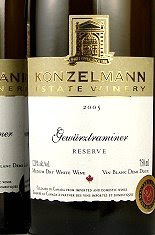 But I just opened up a 2006 Konzelmann Estate Winery Gewurztraminer Reserve and it was an excellent QPR revelation. ($11.99, Costco; available online for under $15) The 2005 vintage is pictured to the left, because I threw out the bottle before taking a label shot. The Konzelmann's have been making wine since the 19th century, first in Germany and more recently on Lake Ontario. They selected their Canadian site because it has a microclimate similar to Alsace, and is particularly well-suited to Pinot Noir, Riesling, and Chardonnay. For just over $10 I enjoyed their off-dry Gewurztraminer that had almost textbook varietal characteristics. The wine was a rich, golden color. Pronounced, perfumed aromas of peach blossom and flowers were the preamble to flavors of peach, nectarines, and golden delicious apples. Everything about this wine was sun-drenched and juicy, and though the wine was off-dry it seemed more soft than sweet and in good balance. This wine would be perfect with spicy Thai or Indian food, where the sweet fruity flavors would be a nice counterpoint to the warm cumin and coriander and bright lemongrass and basil that are common in foods from these regions. We had it with Coconut Curry Pork with Snow Peas. The meat and vegetables were tossed in a sauce made with coconut milk and Thai red curry paste. The dish has cubes of mango in it, and the mango brought out all the rich peach and nectarine flavors. With some nutty brown rice and this juicy Gewurztraminer, it was an ideal pairing. What was the last Canadian wine that you had? If you have any suggestions for other good value Canadian bottlings, please leave them in the comments below. All over the world, fancy winemakers blessed with more fruit than their limited production wines can use, or fruit that is almost but not quite up to their standards, are crafting wines under second labels. Here in the US, these second labels are often guarded as big secrets. I've had more than one person tell me who the real maker of a second label was as long as I promised not to reveal it. More open "secret second labels" include the great Napa Cab maker Larkmead's second label wine, Meadowlark. Once Gary V has outed you, it's pretty hard to achieve plausible deniability. In an odd twist, France is quite open about its second labels. Lots of chi-chi makers have second labels, and they're quite proud of them. So it was with real anticipation that I opened a 2003 Sauternes bottled under the second label of the famed Bordeaux producer Chateau Suduiraut. Called Castelnau de Suduiraut, this is (like many second labels) an unbelievably good wine for an unbelievably good price. I received this bottle as a sample from the Bordeaux Wine Bureau, who puts out a list of the 100 top Bordeaux values every year. To give you some pertinent details, the Chateau Suduiraut Sauternes is a premier cru wine from Bordeaux. The 2003 bottle scored 93 points consistently across the board, and had a suggested retail of $55 for 750ml (though that size bottle is now going for $50-$100). Right now the average price for a 375ml bottle of the stuff is $35. The 2003 Castelnau de Suduiraut, on the other hand, is available at lots of places for under $15 in the 375ml format, and virtually every place for under $20. Want a bigger bottle? 750ml bottles go for $30-$50. So how was it? In short, it was excellent QPR. 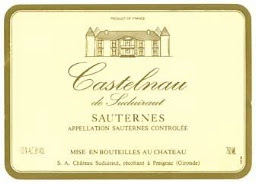 The 2003 Castelnau de Suduiraut Sauternes was a lot of bang for the buck, and though not as transcendent and ethereal as some of the most expensive Sauternes, it was full of the spicy, sweet, and honeyed flavors that make this most people's favorite dessert wine. If you've had dessert wines in the past and found them unidimensional and sickeningly sweet, that's not what you experience in good Sauternes. Instead, the fruit I always think of is pineapple. There is a sweet yet acidic quality to a good Sauternes and this wine had it. It was honey-colored, and slightly less thick than some Sauternes that I've tasted. There were prominent aromas of pineapple, coconut, and honey and these aromas developed perfectly into the flavors. As the wine opened up a bit during the course of the evening, the flavors continued to deepen and gain some weight, which suggested to me that this wine--though delicious now--will be even better in a few years. Because it is not terribly sweet for a dessert wine I would think of pairing it with cheese and fruit for dessert, or just sipping it on its own. If you are looking for some inexpensive but excellent Sauternes to try, or to buy in multiple bottles so you can stash them away and open one every now and again, this is a no-brainer choice. 2003 was an excellent vintage, and this is an excellent QPR way to get a taste of it. The web is a big place. No matter how good you are at concocting perfect search strings on Google or whatever search engine you're using, when it comes to finding information on wine it can be damn hard to locate something useful. They say they're in Beta, but they look like they're all set to become the Alpha Wine Information Search Engine. With over 13 million pages of online wine information indexed and searchable, this is like a one-stop online reference library. And because it's dedicated to wine, just a word or two in the search box will usually yield results--the kind of results you're looking for, not the stuff you have no interest in when you type in Cabernet Sauvignon (as in, Cabernet Sauvignon bath products). 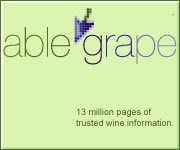 What kind of information is gathered on Able Grape? Reference works, producer websites, blogs, scientific articles, event information, tasting notes are all included in the database, and then they're just a click away. Check out the site next time you have a wine question, like what does Pineau d'Aunis taste like, or what kind of soil Pinot Noir likes. It's probably faster than driving to your local library to try to find the answer on Able Grape. Sensory memories are tricky things. Sometimes you could swear you've seen something or been somewhere or heard a song--and it turns out you're imagining it. I've been blessed with a photographic memory, which can be a curse when loved ones rely on you to remember exactly where the bbq sauce is in the refrigerator (it's in the third bottle in from the left side on the second shelf, by the way). I've also been blessed with more than a touch of the nasal equivalent, though I don't know what that would be called. Smells evoke very powerful and precise memories for me. Oxford's Covered Market, for instance, has a peculiar smell of age, damp stone, warm meat, wilted flowers, baked sugar, and ripe produce. When I smell any two of these odors in combination, I'm back in England shopping for food and trying to resist buying a tin of Ben's Cookies. Burnt chocolate and coffee--Paris, no question. Hot tar--Washington DC in August, where it is actually so hot that the roads feel spongy underfoot when you step off the curb. Similarly, one whiff of warm, sunbaked herbs releasing their oils into the atmosphere and I'm in Rome in the summertime. This wine reminded me of Rome even though the herbs involved were not the rosemary, basil, sage, and pine that made such an impression on me when I lived there. The 2005 Sergio Mottura Grechetto was made from organic grapes grown to the north of Rome in the province of Viterbo. I paid $17.99 in a local supermarket, and you can expect to pay the same at most merchants. Grechetto is a Greek grape--and one of those little reminders that maybe the legends about Trojan War refugees settling Lazio may not be far-fetched. It has a thick skin that is good for fighting off mildew, and it is often used as a blending grape in white wines that come from the Orvieto region of Umbria. Here, the grape shines on its own in the hands of one of Lazio's most well-known producers and results in a wine that was golden in color. The most striking and unusual thing about the wine was that the aromas were almost entirely herbal rather than fruity. I smelled tarragon, thyme, eucalyptus, and a bit of warm sage. The herbal notes continued to tingle and develop on the tongue, accompanied by a slightly saline tang and some warm, stony notes. There was no fruit until the aftertaste, when I thought I tasted just a bit of bitter lemon. This wine won't appeal to anyone looking for a fruit bomb of a wine, but for those of you who like something in the herbal and stony category, it represents good QPR. Because of this wine's abundant herbal notes, it was an excellent partner for some fennel-crusted pork tenderloins and an orzo salad with pesto vinaigrette. I followed this recipe for the pork (and omitted the side dish) and this recipe for the salad (and omitted the shrimp). The herbs used in both dishes were excellent with the wine, and accentuated the complex mixture of flavors. Without food, I suspect this wine would not be as impressive, and it might even strike you as a simple quaffer. With food, however, the wine really strutted all its herbal stuff. Does the smell of a wine trigger your memories? If so, it's likely that those memories add to your enjoyment of a particular bottle as much as the taste and the friends and family with whom you share it. For years the US was awash in a particular kind of rosé wine (White Zinfandel) that was soft pink, softly flavored, and sweetly innocuous. They were quaffers, with very little flavor and virtually no substance. Now, there are rosés for every taste, from light, salmon-colored dry Tavel to zesty Italian and Spanish wines made from a blend of full-bodied grapes. As you might suspect from seeing the dark color of the wine to the right, these richer, rounder rosés can drink more like red wines than white wines and stand up to everything from pepperoni pizza to grilled cheeseburgers without any problem. Because they are chilled, they seem lighter and more refreshing than red wines--especially on warm summer evenings when just the thought of drinking a red can be a little daunting (even if you've stuck it in the fridge for a bit like you're supposed to in order to get its temperature down into the 60s). 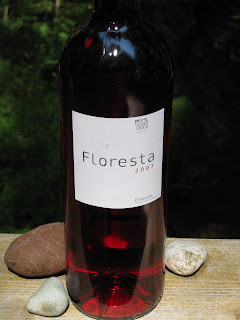 We just had a robust rosé in the 2007 Pere Guardiola Floresta Rosado, which is made from a blend of Grenache, Merlot, and Carignane, which is known as Mazuela in this region. ($9.99, Weimax; also available from The Spanish Table for $11.99). 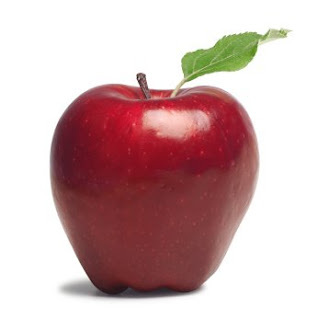 It has the color of pomegranate juice: a very clear and dark red. When opened, you could smell raspberry, pomegranate juice, and even some cranberry. The flavor spectrum was more inclined to ripe raspberry, and there was some wet stone as well as a zing of cranberry in the aftertaste. There was a surprising amount of grip and pucker from tannins in the wine, but they only helped to balance out all the fruit. This was a juicy, flavorful wine that I think would be perfect for Indian Summer weather, and represented very good QPR for its reasonable complexity and attractive price. This Pere Guardiola Floresta Rosado seems made for Paella or something spicy made with chorizo, but don't be afraid to pair it with other dishes. Rosés are very flexible when it comes to food pairings, and they seem especially adept at handling culinary curve balls and weird mixes of flavors and textures. I pasted together a vaguely Mediterranean meal with a slightly unorthodox chicken piccata, garlic mashed potatoes, and a salad of fennel, orange, and arugula. That's a lot for a wine to handle--garlic, lemon, orange, anise, garlic, artichokes, capers, and olives. And this wine handled it. Even though the summer is waning, there's still at least eight good weeks of rosé weather ahead of us in most parts of this country. If you are looking for something a bit different than the pale salmon French rosés with which you started out the summer season, switch over to some rosés that drink like reds from Italy and Spain. In Lazio, as in all of Italy, wine is something that goes on the table with food. 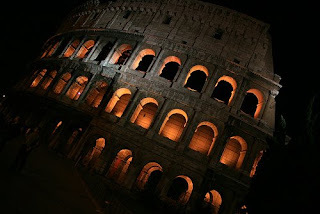 Rome has long been associated with gourmets, since its population has been dominated historically by politicians, priests, and the elite female entertainment industry of the professional courtesans. One of my favorite Roman sayings is "Chi se vo’ impara’ a magna’, da li preti bisogna che va," which translates into "If you want to learn to eat, you've got to go to the priests." Satisfying and simple food like pasta and gnocchi, artichokes, pollo alla Romana, Saltimbocca, and soups such as pasta e ceci make the wine and food of Lazio a feast for the soul as well as the belly. I'll have a white wine review and a red wine review from this region in the upcoming weeks, and I'm still on the lookout for a sparkler to try, as well. Starting next month we'll start heading north into areas that produce wines just perfect for cooler nights and shorter days. First of all, there has been a slight change of venue for the 4th edition of the Wine Book Club on August 26. Farley, our favorite Wine Poet, has moved the event from her once-upon-a-time blog Behind the Vines to her once-and-future blog Wine Outlook. Same book (Jancis Robinson's Tasting Pleasure), same due date for book reports (August 26), but send your link love and your thoughts about the book to her at Wine Outlook. Farley's had a difficult few weeks in Wine Blog Land, and I for one am glad that she refused to let the management of her former blog network turn off her voice. We need all the Wine Poets we can get! I've been reading and enjoying Tasting Pleasure myself over the last few days, and if you've never read Jancis Robinson's memoir you are in a treat. Why not join us on the 26th? If you're in the Napa area next weekend and you like Spanish grape varieties, think of stopping into the TAPAS tasting at Copia. TAPAS stands for "Tempranillo Advocates, Producers and Amigos"and they are sponsoring this event on August 9, 2008. From 1pm - 2 pm there will be a guided wine and cheese tasting ($20), and from 2 pm - 3:30 pm there will be a walk-around tasting ($25). Dozens of wineries will be at the walk-around tasting, including our beloved Twisted Oak. Tickets and more information can be found on the Copia website. 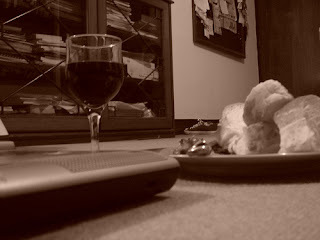 I've joined up with a new blog project led by DHonig of the 2 Days Per Bottle Blog. Called The 89 Project, it's his ingenious attempt to put the spotlight on those wines that get 89 ratings and are thus 1 point away from wine super-stardom and shelftalkers. A growing list of wine bloggers (18 and counting) has agreed to cross-post reviews of 89 pointers over on the 89 Project as well as our own sites, and it promises to be an entertaining and educational experience to see what we all have to say about wines that almost--but not quite--made it into the Promised Land. These wines are often great bargains, and I'm excited to be part of the team. Have a great weekend.! I will have a post at Serious Grape at some point this weekend where I taste test one of Dan Berger's "wines that will never reach 90 points." Guess what? It was fantastic.